I just saw a cool Angewandte paper from Professor Chiba’s lab at the Nanyang Technological University in Singapore. This manuscript serves as a reminder to all of us: think about the role of resonance structures on reactivity! The authors were able to extract some impressive benefits from the enamine character of the vinyl azide functional group. Vinyl azides can be generated using the method developed by Professor Alfred Hassner (I met Alfred in the 90’s when he was visiting Olah’s lab… He is a class act!). Hassner’s method calls for in situ generation of IN3, which is electrophilic enough to react with olefins. 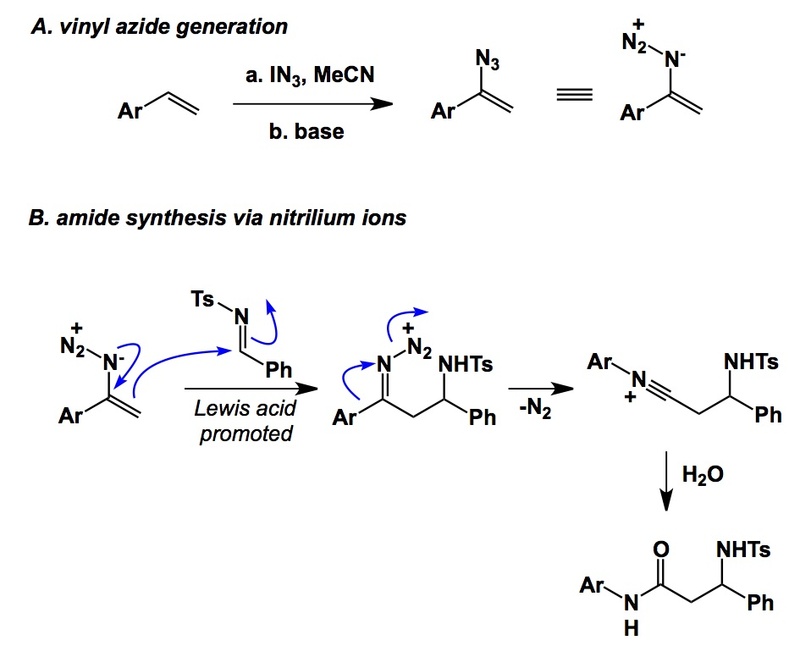 Upon base-induced elimination of HI, vinyl azides can be isolated in good yields. Chiba and colleagues found that vinyl azides react with a range of electrophiles to generate iminodiazonium ions. Following a Schmidt- type rearrangement, nitrilium ion formation ensues. The nitrilium ion is rapidly hydrolyzed in the presence of water to give the coveted amide linkage. There are a number of finer details here, such as the use of hexafluoroisopropanol to improve isolated yields, temperature optimization, etc. Needless to say, what’s shown below is an unsymmetrical substrate where selectivity towards migration is due to the presence of an aryl group. Not surprisingly, two alkyl substituents around the C=N bond would lead to comparable migratory aptitude of the two substituents (and lower selectivity). Regardless, this is a very clever method that builds on the fundamentals and one’s ability to employ what others might have seen, but have not put to good use.